CCC's School Code is 031004. CCC receives FAFSAs every Wednesday afternoon. Check your status at MyCCC. The Scholarship Application for 2019-2020 has closed. Go to our Scholarship page for more information. View our tax information regarding the 1098-T you received in the mail from CCC. The Office of Student Financial Aid & Veteran Services is here to assist students in funding their education. Financial Aid includes scholarships, waivers, grants, loans and work-study employment. 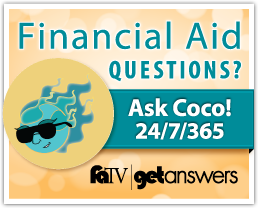 Financial Aid files typically take two to three weeks to go through the verification process. Financial Aid disbursement for eligible students who have chosen direct deposit is on Fridays beginning the third week of classes- February 1, 2019, for the Spring 2019 semester.